The theatre of the living and the artificial is disappearing. The image is sheltered from the real and the imaginary. On a planet that has been invaded, not by green aliens but by images, Patricia Piccinini questions our future as humans. And in doing so, she avoids the monstrous image to concentrate on the image of the monster: monstrum, monstrare. The monster is revealed. 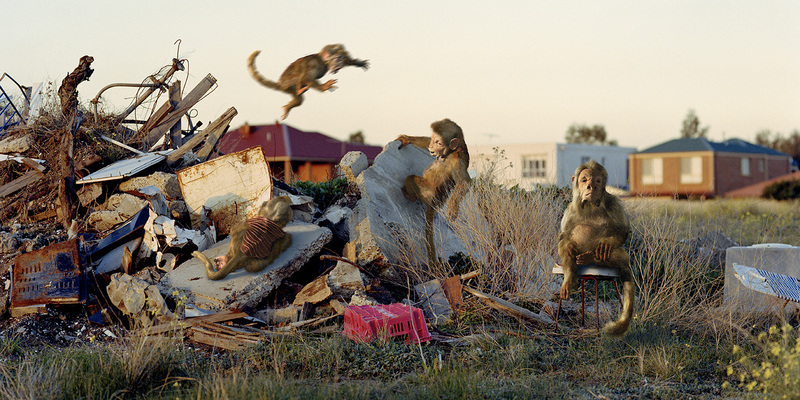 Piccinini parodies monstrosity and demonstrativeness as a kind of apocalyptic precursor. In her surprising and captivating universe, forms drawn from biology and aesthetics swing between Frankenstein and Walt Disney, Pixar and H. R. Giger, and The Island of Dr. Moreau and Dolly the sheep. In the artist’s native Australia, the fauna has evolved endogenously to produce species not found anywhere else in the world. How long will these animals survive if their environments are threatened? As if on a rescue mission, Piccinini has conjured up a new species whose role is to protect endangered creatures. This gesture reminds us that life increasingly pushes the boundaries of nature, resulting in implants, in vitro fertilization, cloning, biotechnology, mutations – in short, genetic tinkering. Another Life, Piccinini’s first solo exhibition presented in Canada, conveys a sense of fascination and horror of the monstrous when it permeates everyday life, as an embodiment of the Freudian Unheimlich (uncanny). If human beings are animals that know how and are able to smile, as George Steiner stated, what does post-humanity have in store for us? Will we be able to reject the new barbarism? In all likelihood, we will be capable of doing so only by opting to humanize technology, rather than technologize people. Patricia Piccinini was born in 1965 in Freetown, Sierra Leone; she lives and works in Melbourne. Her works have been presented in solo and group exhibitions at the Tolarno Galleries in Melbourne (2015), the Australian Centre for Contemporary Art in Melbourne (2014), the National Portrait Gallery of Australia in Canberra (2014), the Museum of Contemporary Art in Sydney (2014), the Canberra Museum and Gallery (2013), the Museum of Contemporary Art in Taipei (2013), the Haunch of Venison in London (2012), the Victoria and Albert Museum in London (2011), the Museum of Contemporary Photography at Columbia College in Chicago (2011), the Mori Art Museum in Tokyo (2010), the Frye Museum in Seattle (2007), and the Venice Biennale (2003). Her works are in many prestigious public collections in Australia, such as the National Gallery of Australia, the University of Melbourne, the Waverly City Gallery, and the Parliament House. In 2014, she received the Artist Award from the Melbourne Art Foundation. She is represented by Tolarno Galleries in Melbourne.